Kids will enjoy Cottesloe Beach and Perth Zoo. Get out of town with these interesting Perth side-trips: Fremantle Prison (in Fremantle), The Vines Mini Golf (in The Vines) and Caversham Wildlife Park (in Whiteman). Pack the 30th (Thu) with family-friendly diversions at Adventure World Perth Australia. Dedicate the 31st (Fri) to wine at some of the top wineries in the area. 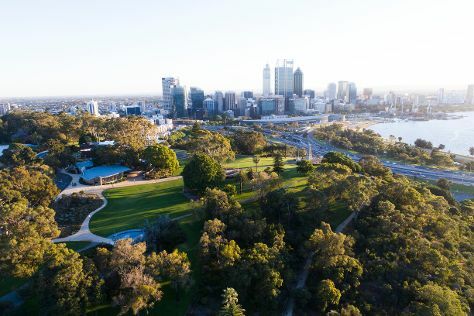 There's lots more to do: take in nature's colorful creations at Kings Park & Botanic Garden, have some family-friendly fun at Elizabeth Quay Carousel, see majestic marine mammals with a dolphin and whale watching tour, and pause for some photo ops at Kings Park War Memorial. To find photos, other places to visit, maps, and tourist information, use the Perth trip itinerary builder . New Delhi, India to Perth is an approximately 15.5-hour flight. The time zone changes from India Standard Time (IST) to Australian Western Standard Time (AWST), which is usually a 2 hour difference. Traveling from New Delhi in May, expect Perth to be colder, temps between 25°C and 11°C. Finish your sightseeing early on the 31st (Fri) to allow enough time to travel to Melbourne. Kids will enjoy Melbourne Zoo and Werribee Open Range Zoo. When in Melbourne, make a side trip to see The Great Ocean Road in Torquay, approximately 1h 40 min away. Dedicate the 8th (Sat) to wine at some of the top wineries in the area. There's much more to do: stroll around Royal Botanic Gardens, admire nature's wide array of creatures at SEA LIFE Melbourne Aquarium, enjoy unforgettable views with a balloon tour, and explore the world behind art at National Gallery of Victoria. To find other places to visit, where to stay, reviews, and tourist information, refer to the Melbourne itinerary builder tool . You can fly from Perth to Melbourne in 6.5 hours. Other options are to take a train; or drive. The time zone difference when traveling from Perth to Melbourne is 2 hours. Expect little chillier weather when traveling from Perth in June: highs in Melbourne hover around 16°C, while lows dip to 6°C. You will have some time to spend on the 10th (Mon) before leaving for home.